The sun is a resource for all to share in common. Ironically, many of the economically poorest parts of the world receive an abundance of the sun’s rays. The Foundation invites people to join together, share their diverse talents, resources, and realities, and help capture the sun’s energy in ways that improve the lives of people in poor communities and enhances the lives of all those who choose to participate in the Foundation’s endeavors. 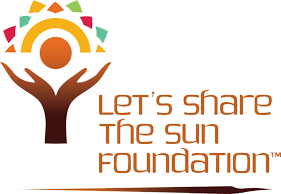 Let’s Share the Sun Foundation aspires to facilitate the use of solar energy in poor communities around the world where harnessing the power of the sun will enhance the quality of life of those communities. The Foundation helps install solar power in some of the poorest parts of the world, including Africa, Asia and Latin America: places that are rich in their access to the sun but lack fundamental resources. The sun is the most abundant resource that all humanity shares. Although its shines equally on all, some are in desperate need of harnessing its power to help them provide basic necessities of life. For one-third of the world’s population, or two billion people, they live in a world without electricity. Until recently, getting power to those living in the most rural areas was impossible. With the development of technology this has all changed. Now, robust solar power can be installed anywhere at a fraction of the cost quoted years ago. Solar power can reduce disease, child mortality and poverty.